Volunteers are needed to teach health and safety classes to the public, including CPR, First Aid, and more. Put your skills as a leader and public speaker to good use as a Red Cross Health and Safety Instructor. Volunteers are needed to teach American Red Cross Health and Safety Education classes to our community, helping them to prevent, prepare, and respond to emergencies. 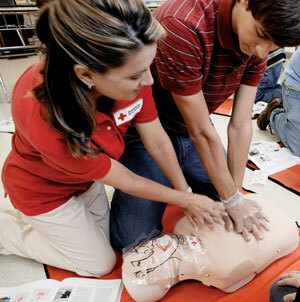 Classes needing trained instructors include: First Aid, CPR/AED, Bloodborne Pathogens, and Babysitting. Demonstrate all skills according to the manual and video. Click here to learn more about this opportunity and to sign up! We are all connected: ArtPrize artist, Red Cross explore "This Enigmatic World"
American Red Cross volunteers & donors honored in "Sweet Celebration"